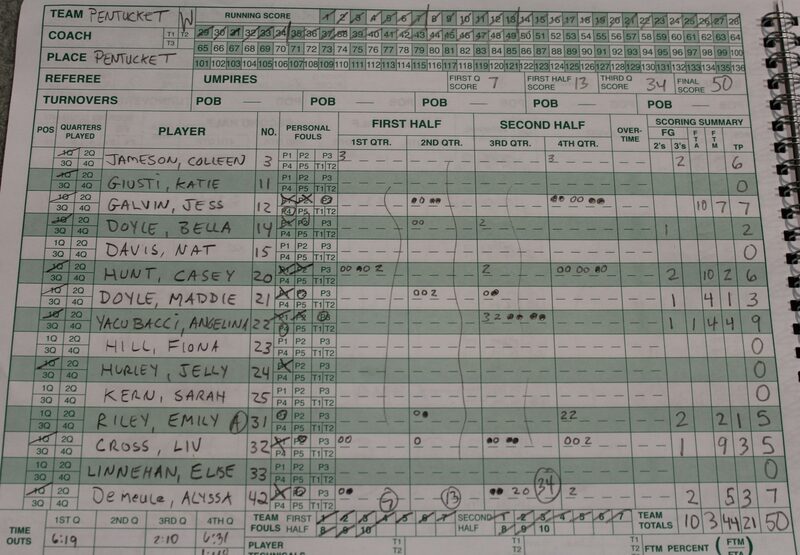 (Newburyport MA) Pentucket 44, Newburyport 32. It’s why I cover games! Scores alone can be very misleading. This wasn’t a “twelve-point” game. This was a close game with FOURTEEN lead changes through three quarters. “Newburyport is a very good team,” said Pentucket coach John McNamara afterwards. And that they were……….for three quarters. The 4th quarter? The Clippers defense was still good, but the offense disappeared. 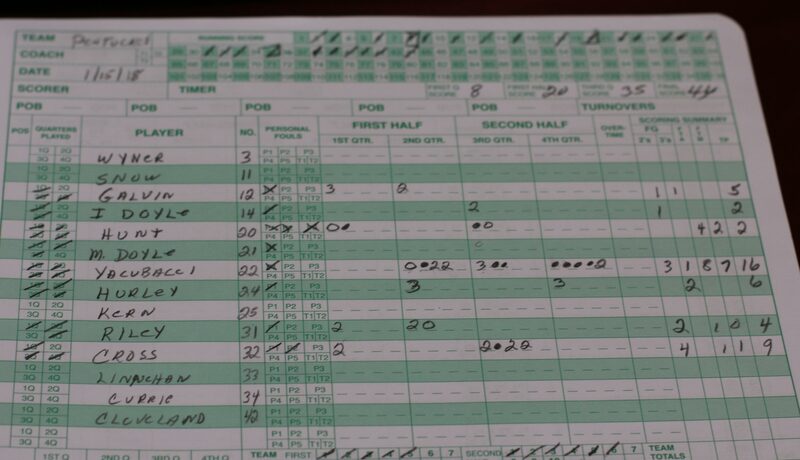 Today’s last quarter probably brought back bad memories from the last time Pentucket and Newburyport faced each other. It was March 1st in the first round of the D2 North tournament. In that one the Clippers were down 12-1 after a quarter and ended up losing badly, 46-19. Today it was the last quarter that sunk the Clippers. They were outscored 9-1 in that quarter and squandered a game in which they were impressive otherwise. The Sachems (8-1) are a team that will press and use defense to create offense. The Clippers (7-2) play a tight man-to-man defense and will run with turnovers and rebounds. 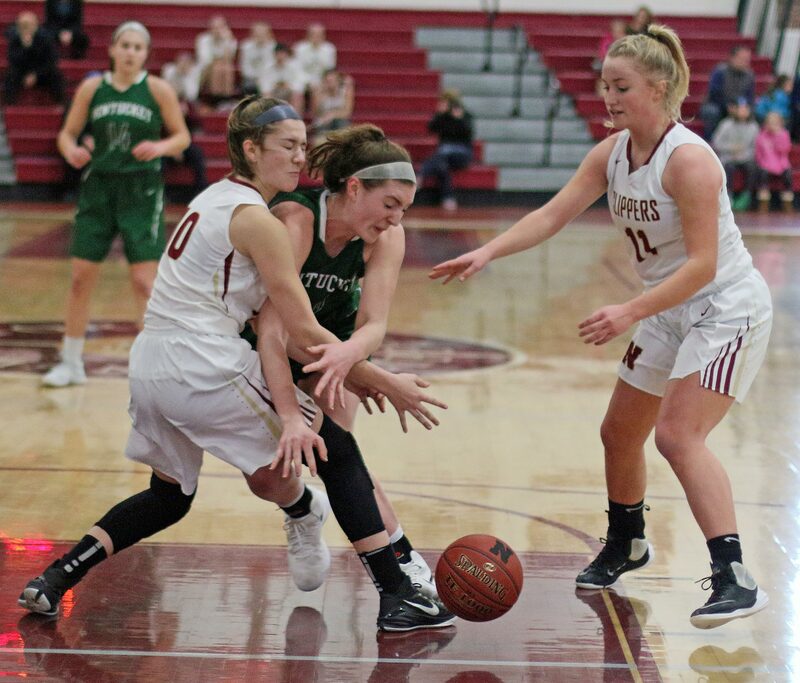 The most impressive thing about Newburyport (IMO) in this game was that they had fewer turnovers (12) than Pentucket did (19). The Clippers took good care of the ball. The most impressive thing about Pentucket? Their game-long organized offense. They certainly looked to get the ball inside to junior Liv Cross (“She’s a stud! – Coach Dollas) but they were patient about it. That patience on offense was most noticeable in the final quarter when Newburyport raised the pressure. Sophomore Angelina Yacubacci topped all scorers with sixteen points. Angelina drained a three in the third quarter and made four straight free throws in the final two minutes to make NHS pay for fouling. 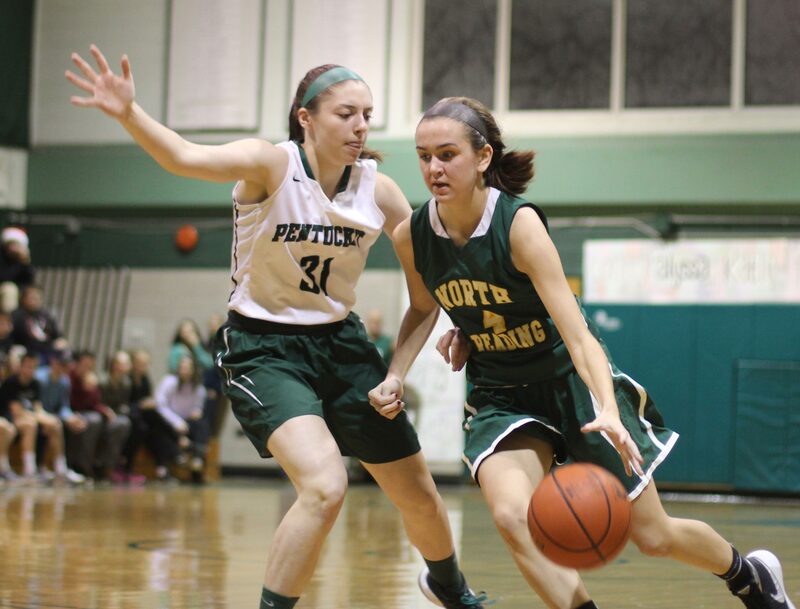 The best one-on-one matchup was between Cape Ann League All-Stars Casey Hunt and Krysta Padellaro. Krysta lost some time because of fouls. “We can’t have her sitting on the bench with foul trouble,” said Coach Dollas. Coach McNamara also had a key player on the bench with fouls. Inside threat Liv Cross sat out in the first half with two quick fouls. “We missed having her out there,” said Coach McNamara. 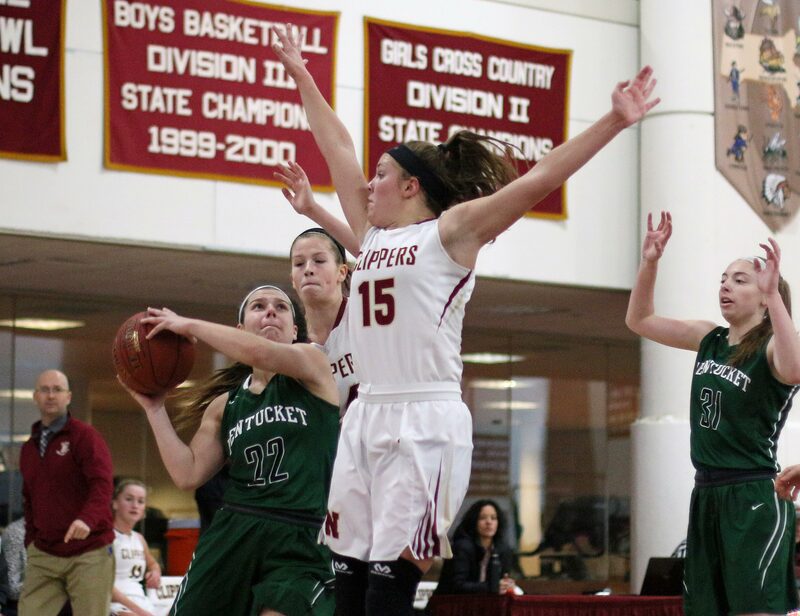 Newburyport broke away from a 9-9 tie 1 ½ minutes into the second half. A rebound basket by Abi Gillingham, a steal and layin by Anna Hickman, and a Maggie Pons jump shot from the right had the Clippers in front by six (15-9). Back came the visitors with nine straight points. 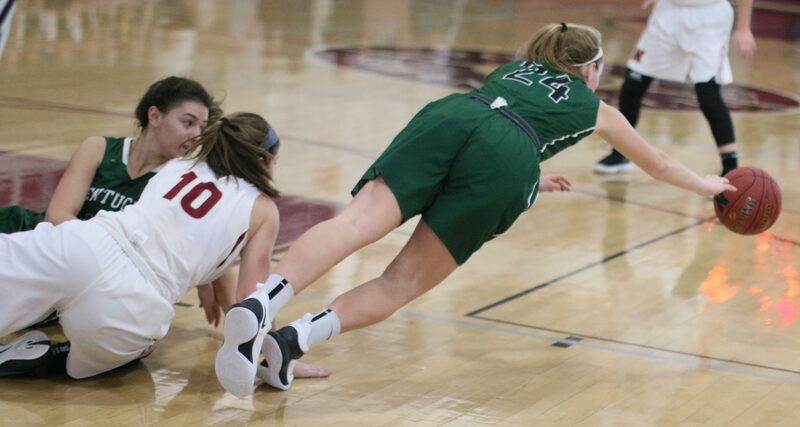 Two inside scores by Angelina Yacubacci and a layup by Emily Riley was followed by a 3-point shot (off the backboard) from straightaway by sophomore Angelica Hurley. Against some teams a Pentucket run like that one is the beginning of an avalanche of points. Not this time. The Clippers had answers and took the lead three more times. 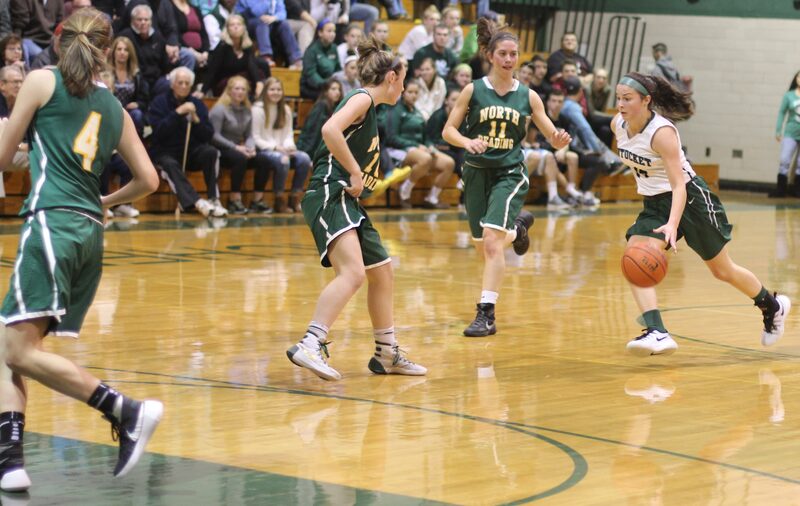 An inbounds play by NHS (to Abi Gillingham) tied the score at 31 with thirty-five seconds left in the 3rd period. 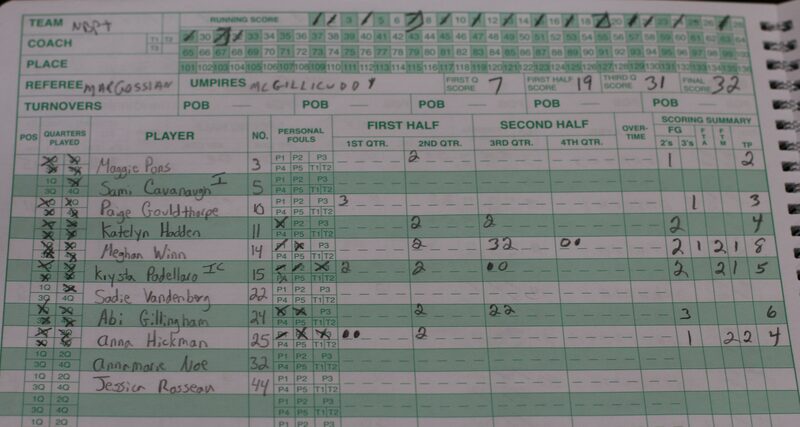 Thereafter, Newburyport’s inability to make shots or even draw fouls did them in. 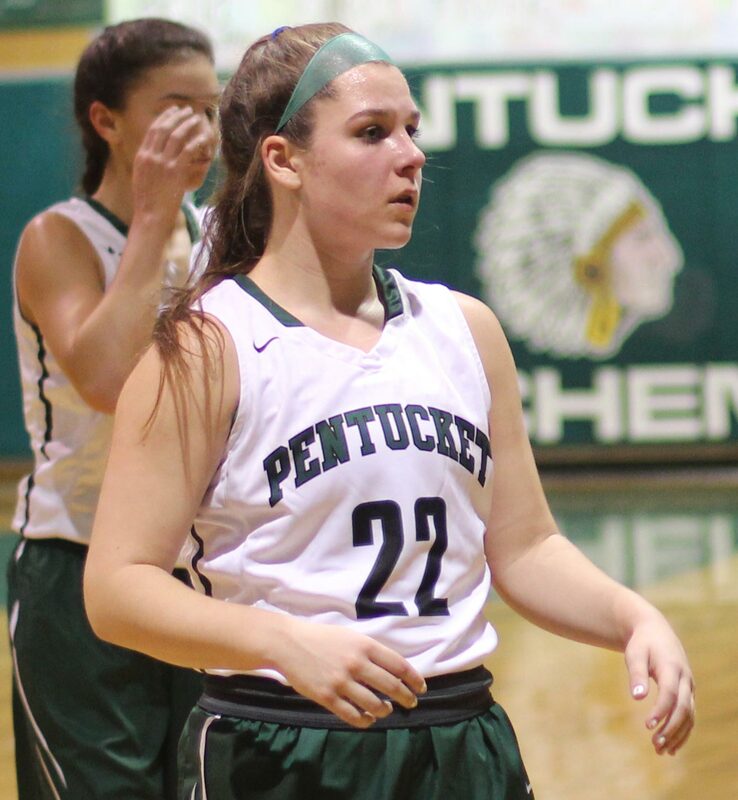 Meanwhile, the Sachems scored the next seven points, including another three by Angelica Hurley (from Casey Hunt) that put Pentucket up, 38-31. 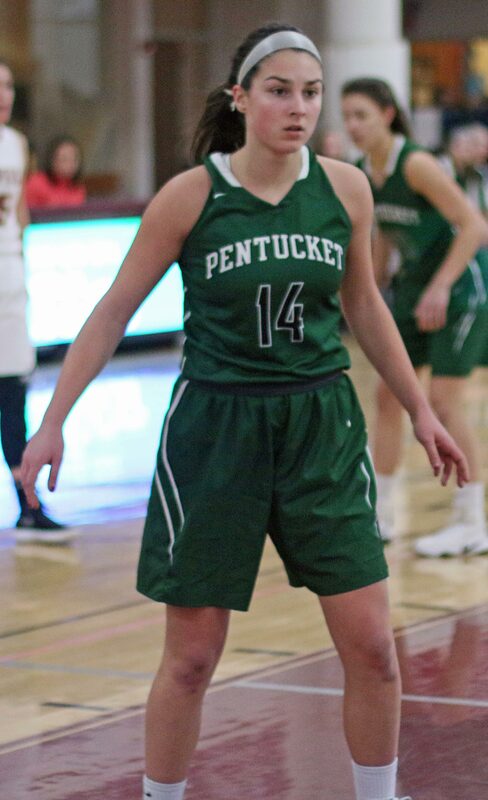 The Clippers finally got a point (free throw Meghan Winn) with two minutes left but the last six points scored in this game were by Pentucket’s Angelina Yacubacci. Pentucket is looking to win their fourth straight Cape Ann League title. Player to watch? 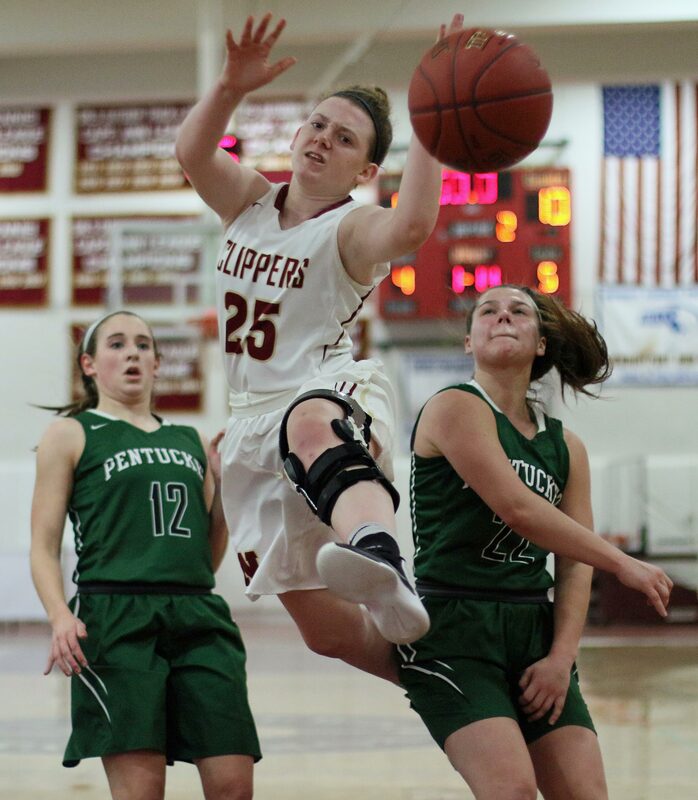 Newburyport’s Abi Gillingham. The 6-1 freshman is a presence at both ends of the court. 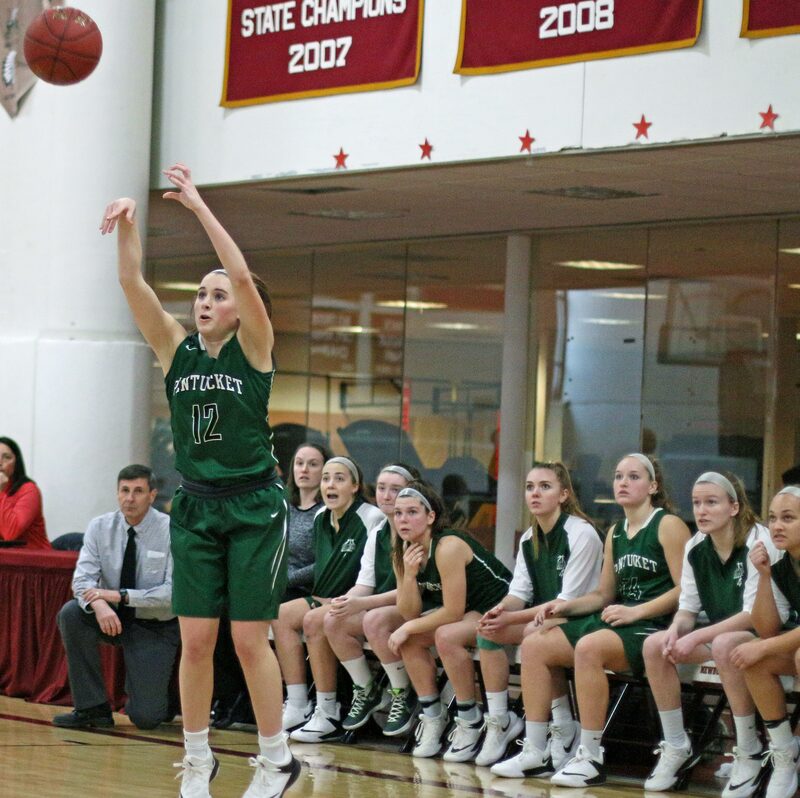 She discouraged several Sachems shooters from even attempting a shot in close to the basket. “She has potential,” added Coach Dollas. Now in his 12th year, John McNamara has a remarkable 240-42 record. Many of those losses are against non-CAL teams. 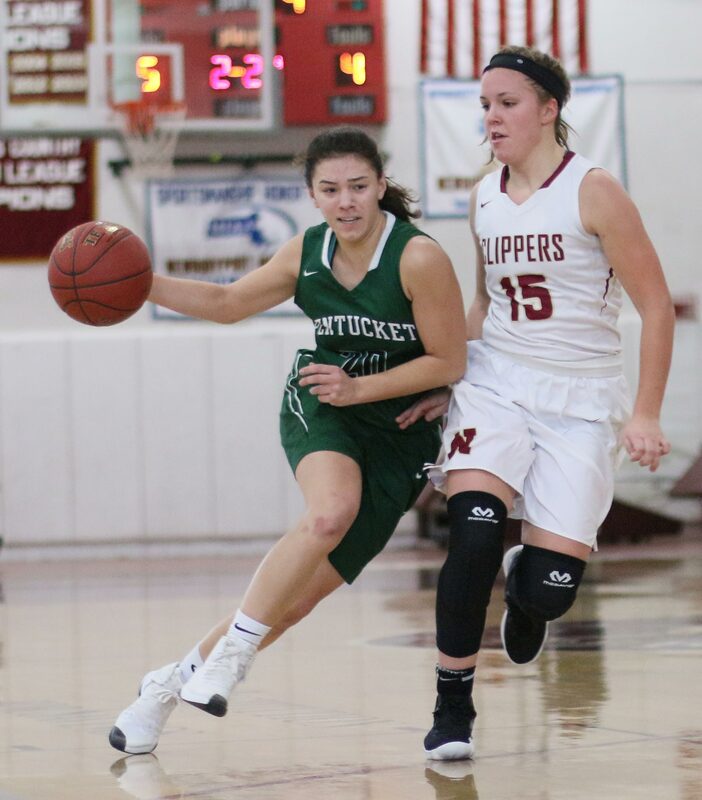 The Clippers did put a 33-29 win together against Pentucket last season on February 14th at Newburyport. The two Division 2 opponents will meet again on February 9th at Pentucket. 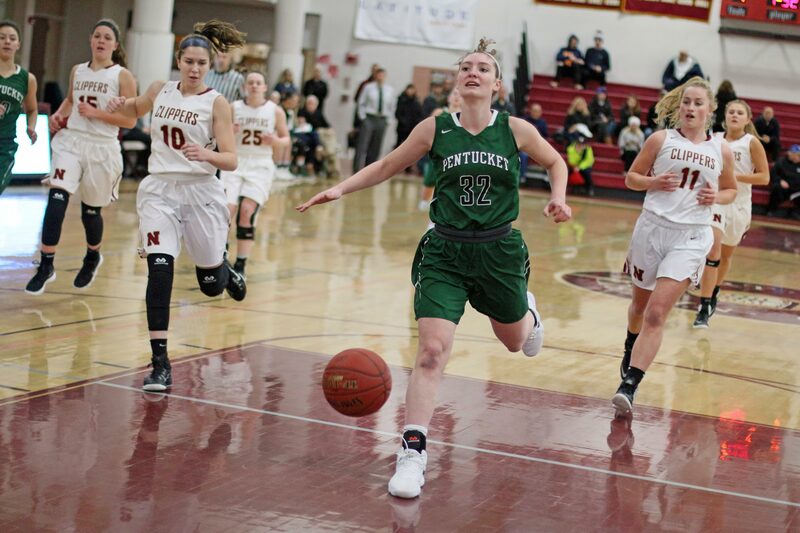 (West Newbury MA) Pentucket had a rousing second half and defeated North Reading, 50-35, in Cape Ann League action on Tuesday night. These teams shared the league title last year and split their games with each other during the season. Graduation had put a serious dent into both teams and I was curious to see what they would be like this season. The defenses on both sides were impressive. There were very few direct routes to the basket. One of the glaring stats in this game was the high number of turnovers. By my count, each team committed twenty-five of them. The traveling violations by both squads almost reached the epidemic level. But that is what happens when defenses play well. 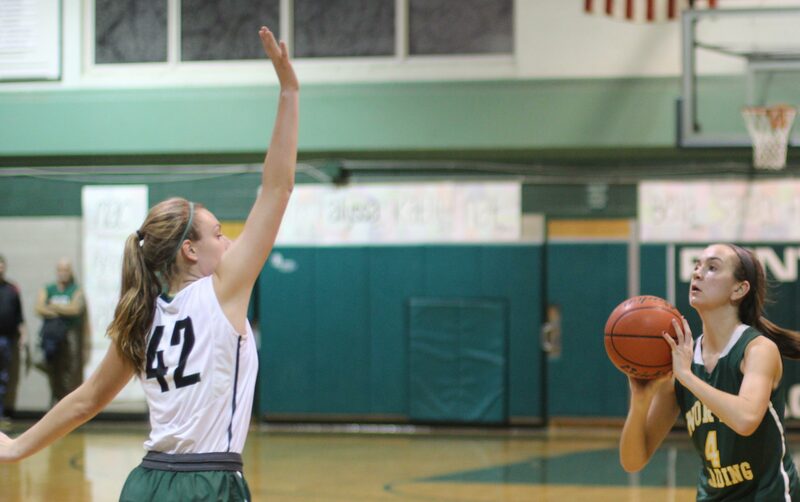 Taylor Moore (33) and Emily Riley (31) eye one of the many rebounds off of free throws. The other glaring stat was the free throw shooting. It was atrocious. The Sachems (3-0) missed twenty-three times while the Hornets (2-1) missed ten. The visitors broke away from a 6-6 tie (2:41 of the first) and had a ten-point lead (22-12) with 2:12 to go in the second quarter. 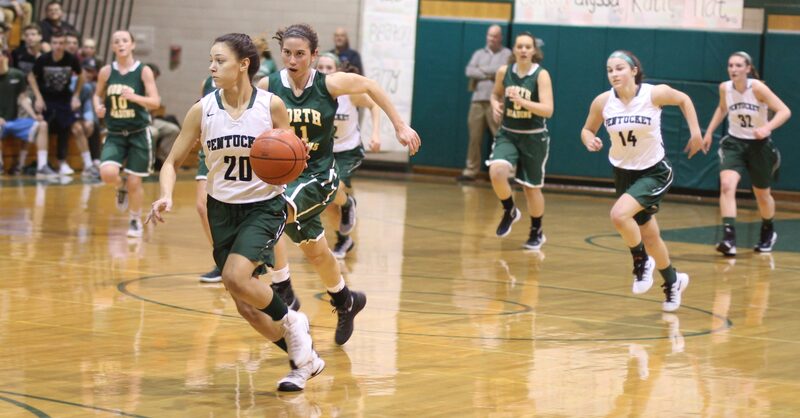 The key to the NR breakaway was made 3’s by Taylor Moore, Victoria Grasso, and Ali Grasso. 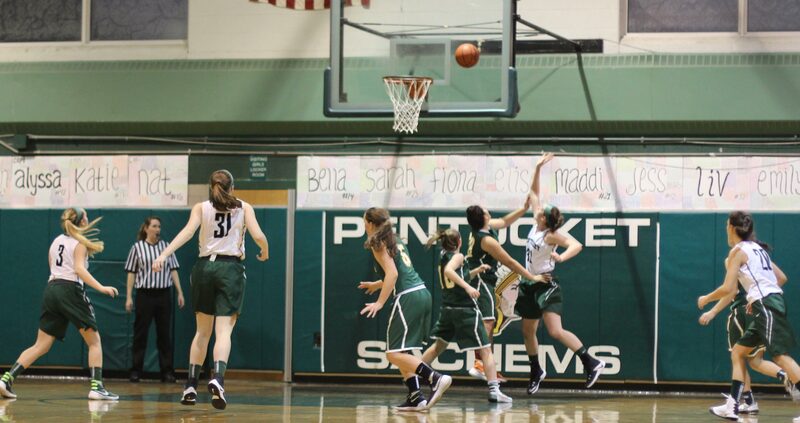 Meanwhile, Pentucket struggled to make any kind of shot. The second half was an entirely different story. 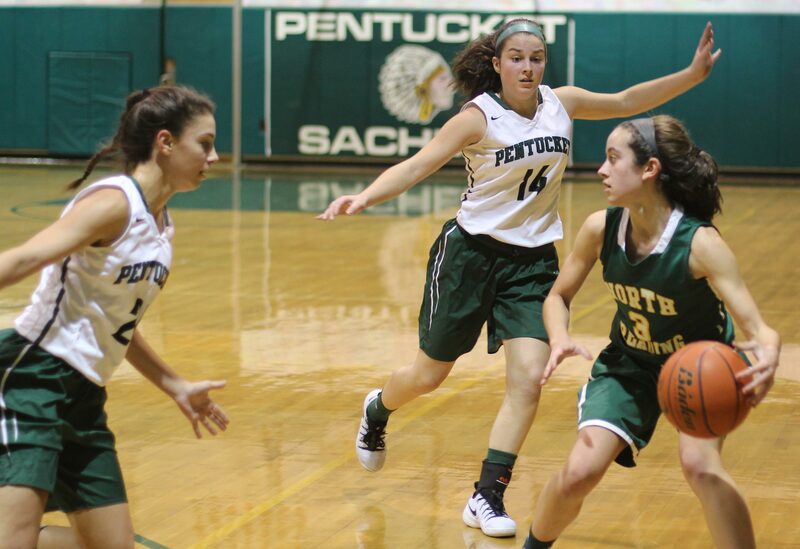 Pentucket put in two freshmen (Angelina Yacubacci and Casey Hunt) to start and off the Sachems went. The home team made shots and that allowed their press to get set up. 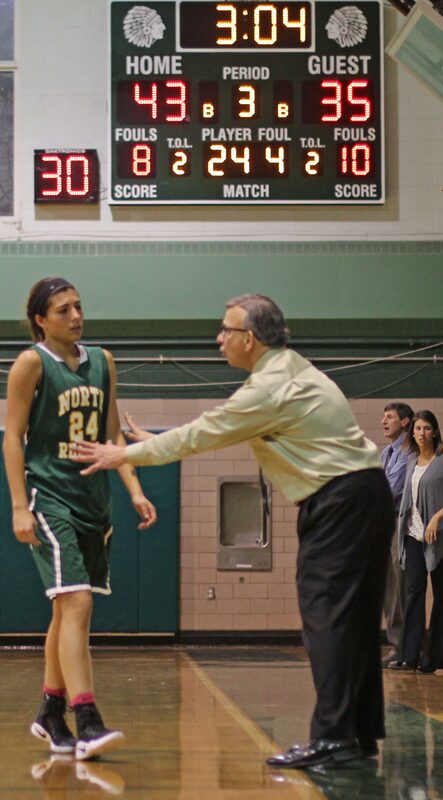 NR did not react well and had eleven of their TO’s in the third quarter alone. 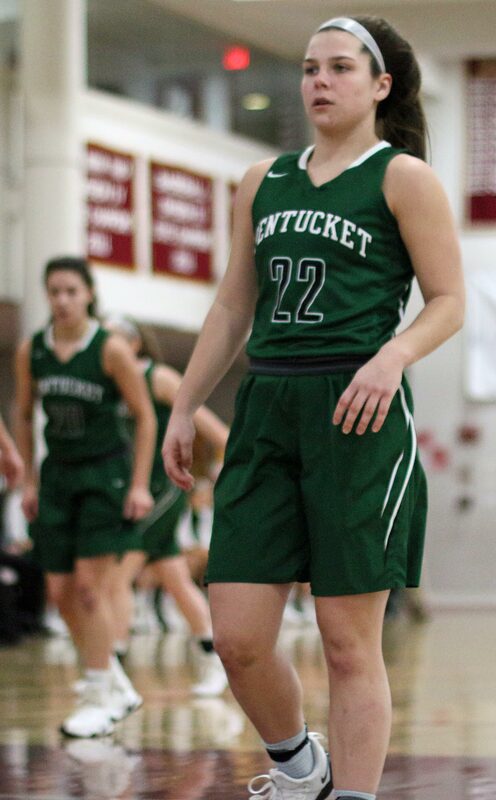 Angelina Yacubacci led the Sachems with nine points and all of them came in the terrific Pentucket third quarter. 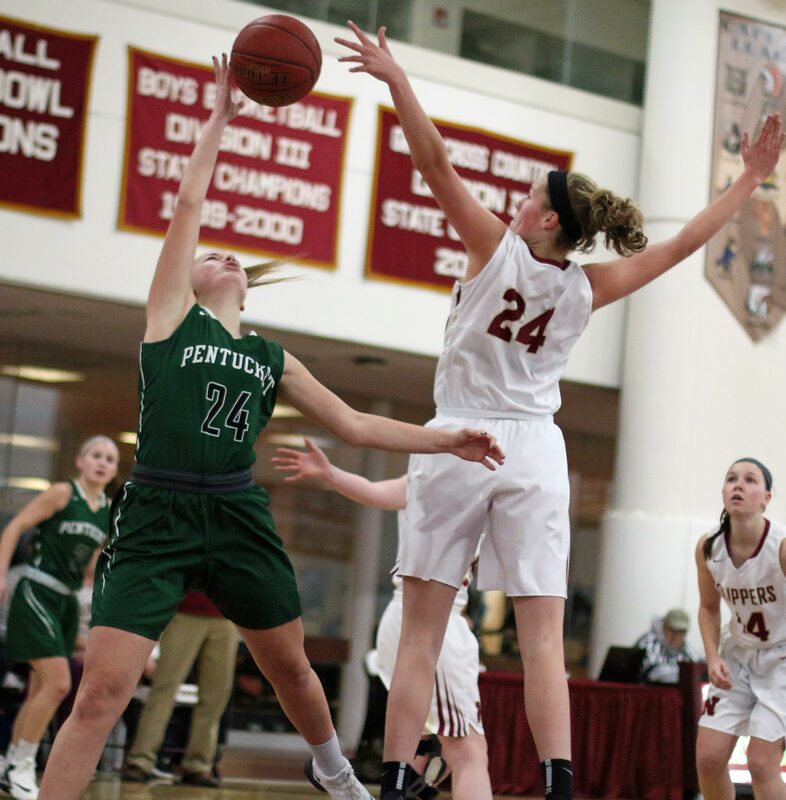 Pentucket put a 15-1 run together to get ahead for good, 27-23 with an Alyssa Demeule layup assisted by Bella Doyle at 2:30 of the 3rd quarter being the final points. By the end of the 3rd, the Sachems led, 34-27, and looked to be pulling away for good. 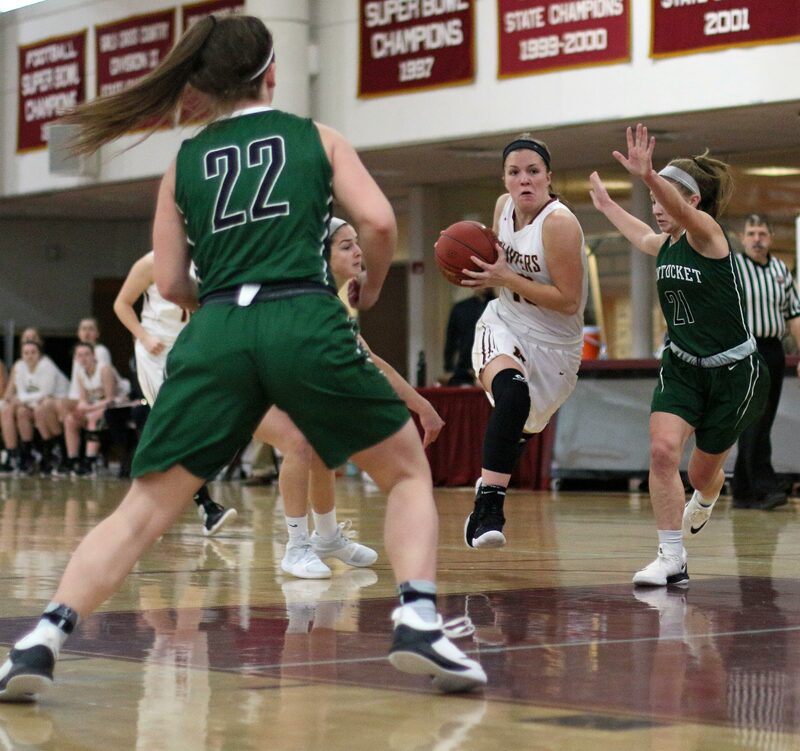 Suddenly, however, in two straight possessions in the final quarter, the Hornets (Casey McAuliffe, Lauren Sullivan) drained 3-pointers. Now within a point (34-33) with 6 ½ minutes left, it was once again anyone’s game. 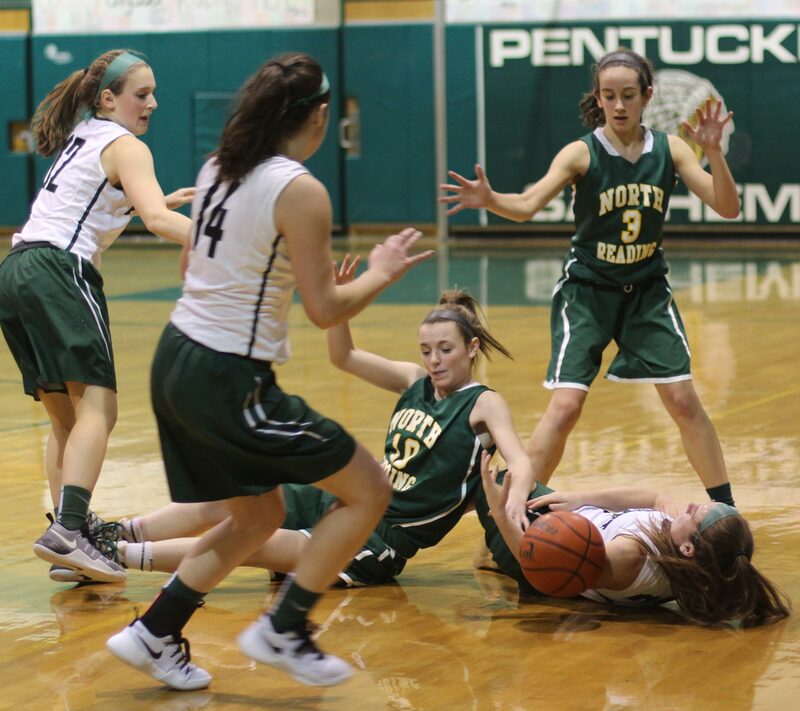 That Pentucket defense that had been good turned to very good over the final 6 ½ minutes. NR was limited to two points by a defense that would not allow penetration. 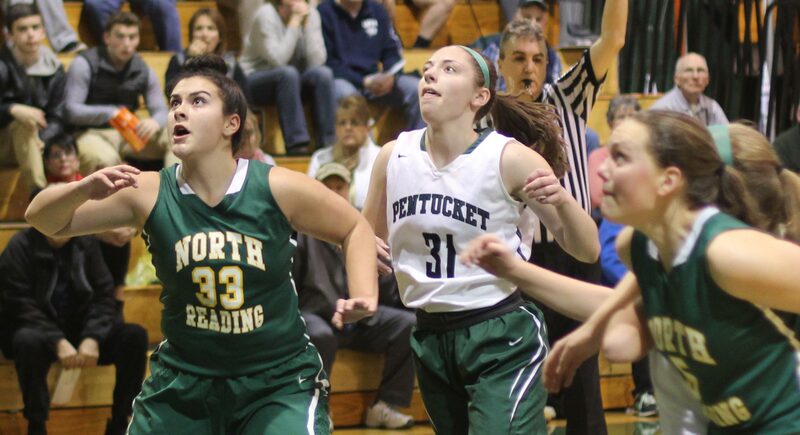 There was plenty of side-to-side stuff going on but getting to the basket ended for North Reading. 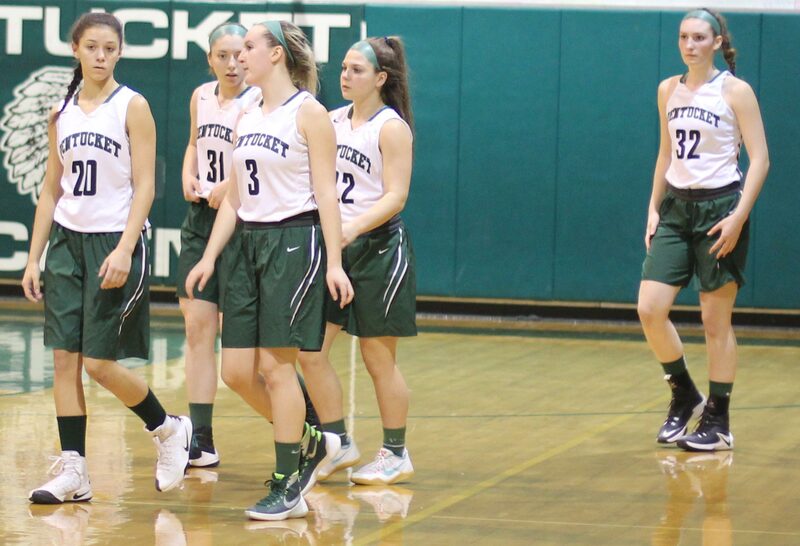 In the same final minutes, Pentucket started with nine unanswered points. They had two layups (Liv Cross, Emily Riley) on assists by freshman Casey Hunt. 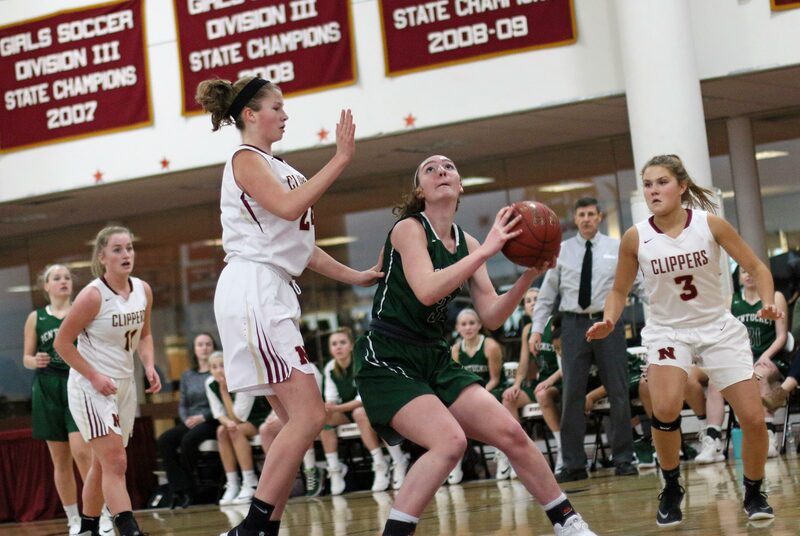 An NR turnover led to a layup (Emily Riley) and then senior Colleen Jameson added a dagger-three to drive the Pentucket lead to ten (43-33) and this game was history. 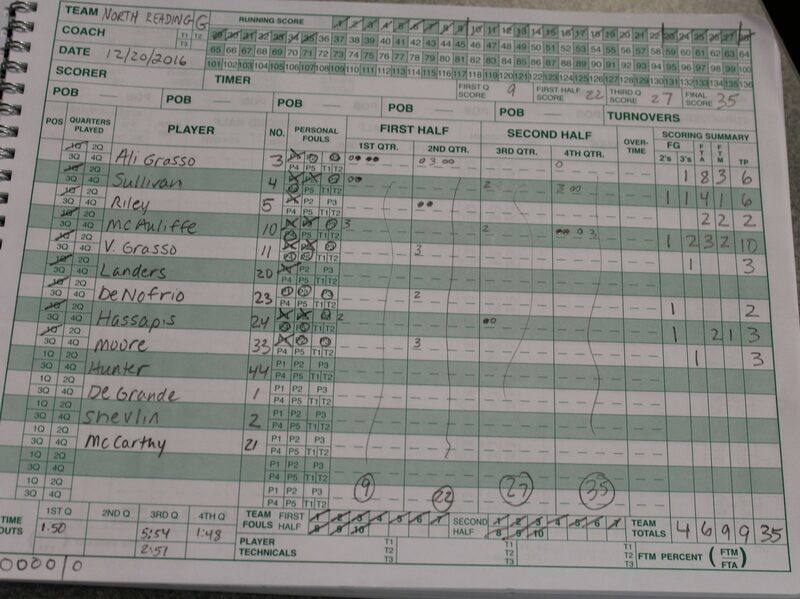 Sophomore Casey McAuliffe led all scorers with ten points. 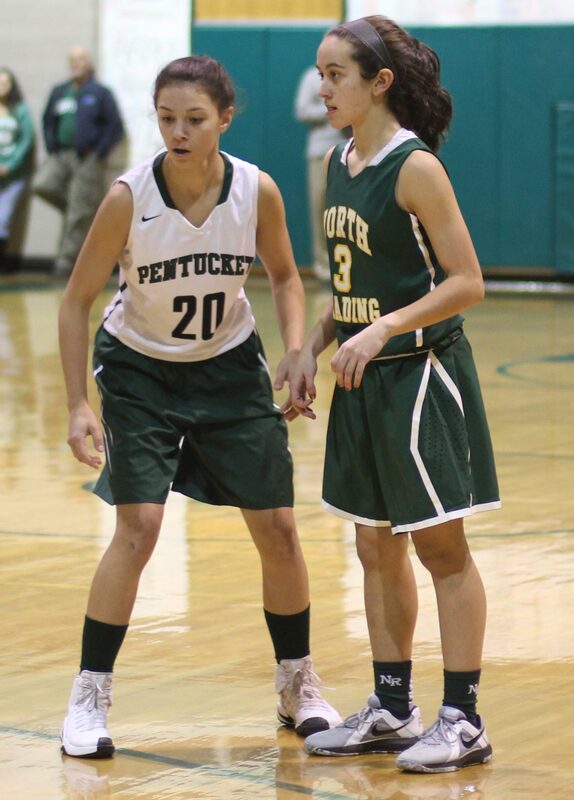 Key matchup, with plenty of future potential, was between freshman point guards Casey Hunt and Ali Grasso. NR’s 6-5 Jess Lezon is now at Yale. 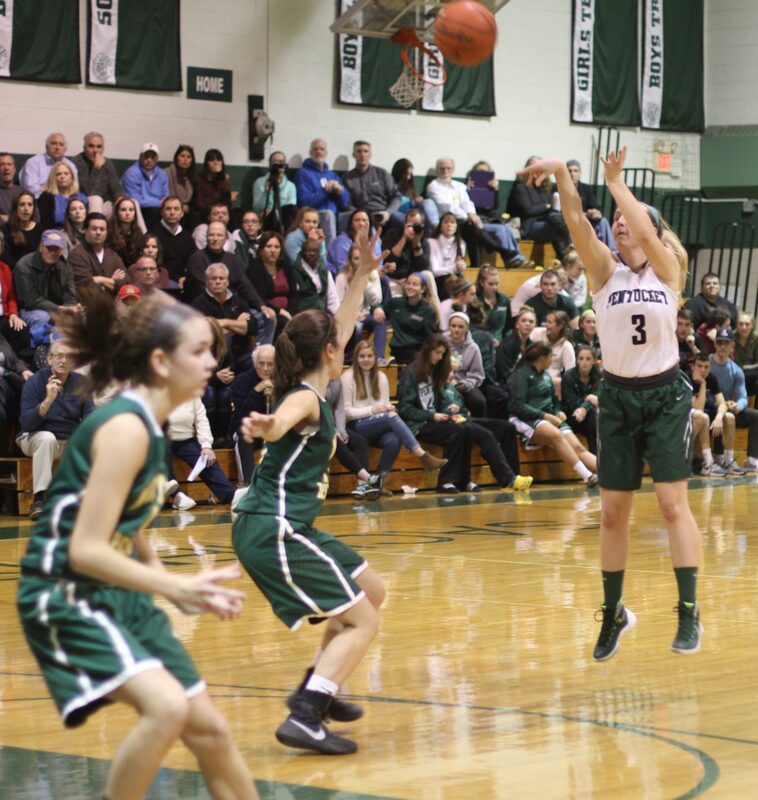 Jess had seventeen points and twenty rebounds in the Hornets win last February at Pentucket. NR’s Kat Hassapis will be playing soccer at Bentley in the fall of 2017. John McNamara’s coaching record at Pentucket is now at 217-35. This year’s team is young but the defense is very good. The offense? They have size but taking advantage of it versus NR led to many turnovers. I’m guessing that the foul shooting will become less “foul” as the season goes on. The biggest surprise for me was the temperature in the gym. What happened to the heat? Anyone who has been there in the past knows how tropical it was. Maybe a window was open? North Reading was 20-3 last year and reached the D3 North finals. Pentucket was 16-6 and lost in the first round to Triton.